Pope becomes parish priest of Catholics on Arabian Peninsula. ABU DHABI – In a country where luxury and excess are considered almost national virtues, Pope Francis on Tuesday became the parish priest of some 130,000 Catholics from 100 different countries, thanking them for their witness and urging them to live simply in accordance to the beatitudes. The New Testament beatitudes, Francis said, overturn popular thinking according to which it’s the rich and powerful who’re blessed. For Jesus, he said, it’s instead the poor, the meek, those who remain just at the cost of appearing in a bad light, and those who are persecuted who are actually blessed. “Let us look at how Jesus lived: poor in respect to things, but wealthy in love; he healed so many lives, but did not spare his own,” the pope said. “He came to serve and not to be served; he taught us that greatness is not found in having but rather in giving. Just and meek, he did not offer resistance, but allowed himself to be condemned unjustly. In this way Jesus brought God’s love into the world. Only in this way did he defeat death, sin, fear and even worldliness: Only by the power of divine love,” he said. 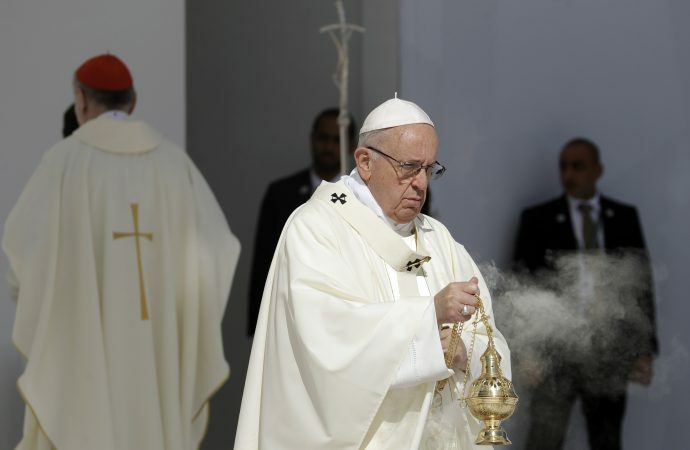 Pope Francis’ remarks came as he was saying Mass at Abu Dhabi’s Zayed Sports City stadium, closing the first-ever papal visit to the Arabian Peninsula. According to local authorities, people came from over 100 countries, including Lebanon, India, Pakistan and the Philippines. In addition, there were some 4,000 Muslims on hand, on a trip marked by papal outreach to the Islamic world. In a bid to show a tolerant face to the world, the UAE has rolled out the red carpet for Francis. The government declared Tuesday a holiday for anyone holding a ticket to the papal Mass, and as the pontiff’s motorcade made its way to the stadium for Mass military planes flew overhead trailing the yellow and white of the Vatican flag. Local Christians seemed energized. One Ugandan taxi driver told Crux she “had to” attend the papal Mass, seeing it as an event with the potential to change history. The Mass, like the trip itself, was historic, marking the first-ever public Christian celebration in a country that preaches tolerance, but where non-Islamic religious minorities generally are not allowed to be public about their faiths. With close to one million people, Catholics represent an estimated 10 percent of the population in the UAE. Virtually all of them, including some 60 priests, are foreigners, and as such, often treated as second class citizens. During his homily, Pope Francis steered away from politics or any of the issues he’d touched upon the night before, including religious freedom, the “demilitarization of the human heart,” and the “miserable crudeness” of war, naming Yemen, Syria, Iraq and Libya, four nations in the region that have seen conflict in recent years. The closest he came to mentioning any sensitive subject was to call Christians to promote peace starting with the community where they live, without renouncing Jesus’s name, and to persevere in the midst of difficulties. “I ask for you the grace to preserve peace [and] unity, to take care of each other with that beautiful fraternity in which there are no first- or second-class Christians,” the pontiff said. The beatitudes are a roadmap, the pontiff said, noting that they don’t require “superhuman actions, but rather the imitation of Jesus.” They are an invitation to keep the heart pure, practicing meekness and justice despite everything, being merciful to everyone and living affliction in unity with God. “This is the holiness of daily life, one that has no need of miracles or of extraordinary signs,” Francis said. The crowd, small compared to the 700,000 people who participated in a papal Mass in Panama last Sunday, was nevertheless almost as diverse as the one taking part on the closing ceremony for the Vatican-sponsored World Youth Day. UAE’s immigrant population comes from some 200 countries, and this universality was visible. The Mass “for peace and justice” was celebrated in English and Latin, but the pope delivered his homily in Italian with live translation into Arabic provided through jumbo screens in the stadium. Before the Mass, Francis visited one of two Catholic churches in Abu Dhabi, St. Joseph’s Cathedral, where he met with a group of roughly 300 faithful. In brief remarks in Italian, he thanked the faithful for meeting him. Soon after Tuesday’s Mass ended Francis was scheduled to head back to Rome on a six-hour flight, during which he’s expected to hold his usual in-flight news conference.